There were plenty of times in the final of the 2014/15 Euroleague qualifying event when it seemed as though ASVEL Lyon Villeurbanne were going to take the victory. When you hold a 19 point lead in a final, it is only natural that your fans start to dream while many of your opposition fans will lost a lot of hope and optimism. This may have been the case in Ostend in Belgium but in the end, UNICS Kazan pulled off an almighty comeback to clinch their place in the 2014/15 Euroleague tournament. As you would have thought, and following on from his performance in the semi-final, and our own predictions for the final, D’Or Fischer was instrumental in the win and the comeback. Fischer managed to contribute 18 points and 8 rebounds to the Russian side and they can look forward to taking on some of the giants of Europe this season. James White was the leading scorer for the Russian team though and his 21 points really made a difference, leaving Lyon fans wondering what might have been. One player who gave his all for the losing team was David Anderson, who managed to grab 27 points in the loss for the French side. This made him the top scorer of the match but ultimately it counted for nothing as UNICS refused to take no for an answer in a thrilling second half. The Russian side may find that their defensive lapses are punished on a more regular basis in the Euroleague and they may find it harder to come back from such a deficit but for now, they will want to savour this win before they get to work on the training court to iron out some of the deficiencies that were exposed in this win. UNICS Kazan will now find themselves in Group A in the regular season of the 2014/15 Euroleague, and they will be facing off against some of the top team in European basketball. The biggest team they will face will be last season’s Final Four defeated finalists Real Madrid, but there will also be stiff competition Andolu Efes, Zalgiris, Nizhny Vovgorod and Banco di Sardegna Sassari. The top 4 teams in Group A will advance to the last 16 of the tournament while the bottom two teams will be palced into the round of 32 in the Eurocup tournament. 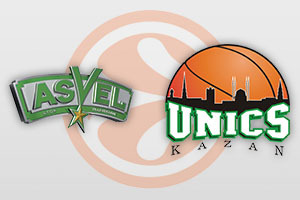 UNICS Kazan reached the final of last season’s Eurocup, so if they do finish in the bottom two positions, they will be looking to go one further than they did in the previous campaign. However, they will be keen to finish in one of the top four places in their group and seeing how far they can progress in the Euroleague tournament. ASVEL Lyon know that they are definitely focusing on the Eurocup this season but their players will no doubt take time to think about how it could all have been so different. The regular season will be played out between the 16th of October and the 19th of December, so there is not long to wait until the new season begins. Champions Maccabi Electra Tel Aviv are placed in Group B and they will be reunited with old foes CSKA Moscow, who were brushed aside on the way to Israeli triumph in Milan in the summer of 2014. Group C has Barcelona and Olympiakos clashing while Group D also has a high profile Greece v Spanish clash due to the inclusion of Panathinaikos and Valencia.